This guide is to assist in speedier and accurate scheduling. Training Modules applied to employees can be searched in the Schedule page. 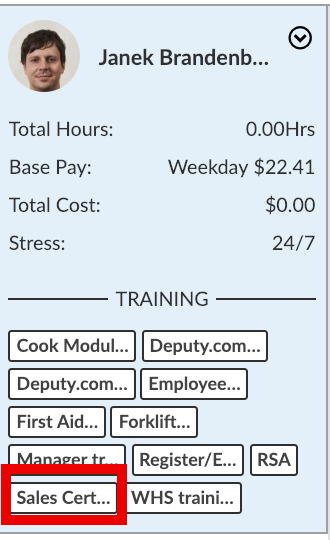 This allows you to see employees with specific training modules applied to them. To set up, add, and edit training requirements, check out our Adding Training Requirements help doc. Head to the Schedule page and click on the Search bar. Type in the training module as it appears Location Settings/Employee Profiles. In the example below, we'll search for 'Sales Certification'. As shown in the screenshot, 'Janek Brandenberger' appears in the list. 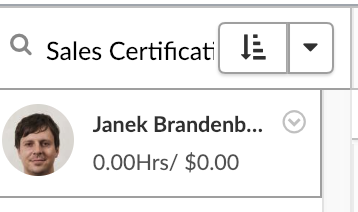 If we click the employee's name, we can see the training modules that this employee has completed. Highlighted is the 'Sales Certification' that we are scheduling for.